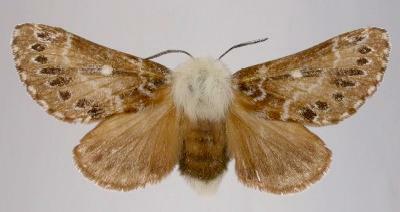 The adult moths of this species are brown, with a submarginal arc of black spots, and a white spot near the middle of each forewing. The hindwings are greyish-brown. The thorax of the males is black whereas that of the females is white. The wingspan of the females is about 3 cms. Part 32, Supplement 2 (1865), p. 572, No. vi 1472.